Geneva - IOM, the United Nations Migration agency, has learned that yesterday (1 March) at about 1710 hours local time, a large number of Boko Haram members armed with automatic weapons, rocket propelled grenades and gun trucks attacked the military base in Rann, in Borno State, northeast Nigeria. Some 55 000 people displaced by the conflict live in a camp near the base, according to a UN spokesperson. IOM staff reported that during the incident four soldiers, four mobile police and three humanitarian workers lost their lives and another three humanitarian workers were injured. Two of those killed were IOM field colleagues. 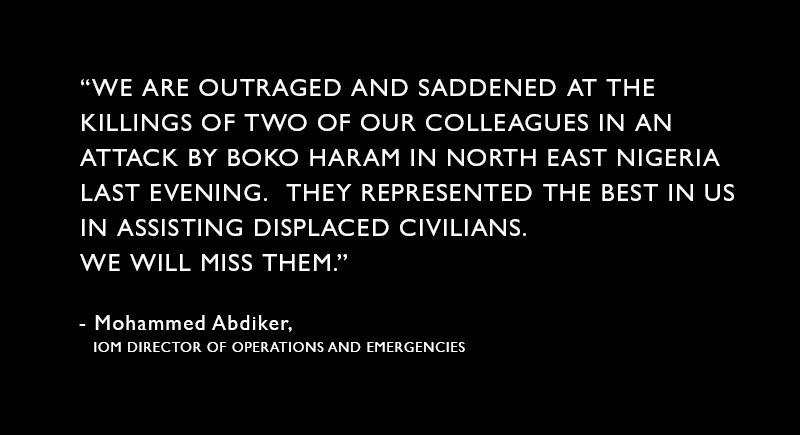 Mohammed Abdiker, IOM Director of Operations and Emergencies, said: "We are outraged and saddened at the killings of two of our colleagues in an attack by Boko Haram in North East Nigeria last evening. They represented the best in us in assisting displaced civilians. We will miss them."